(Scan thanks to Stampboards, Australia). George Collingridge de Tourcey's Noumea journey. 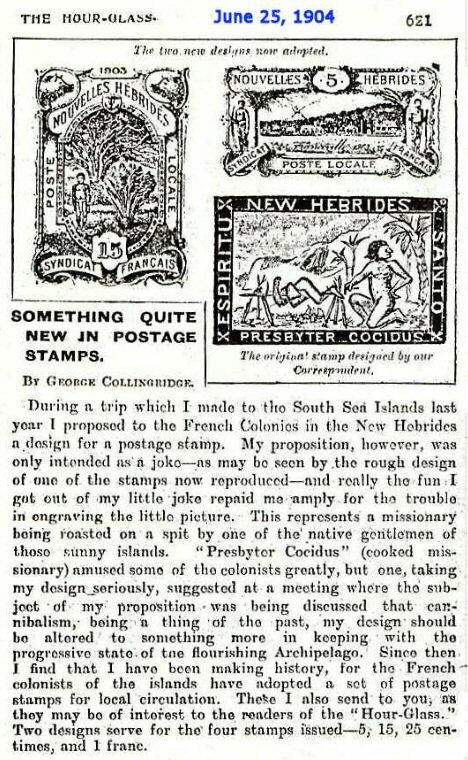 "During a trip I made to the South Sea Islands last year I proposed to the French colonists in the New Hebrides a design for a postage stamp. 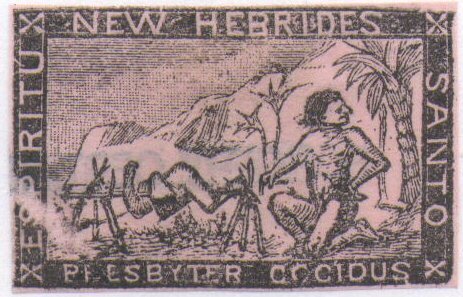 My proposition, however, was only intended as a joke -- as may be seen by the rough design of one of the stamps now reproduced -- and really the fun I got out of my little joke repaid me amply for the trouble in engraving the little picture. 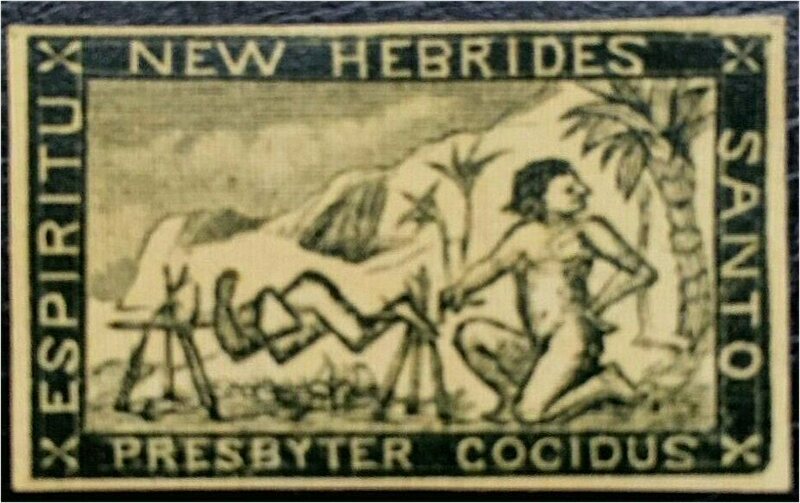 This represents a missionary being roasted on a spit by one of the native gentlemen of these sunny islands. 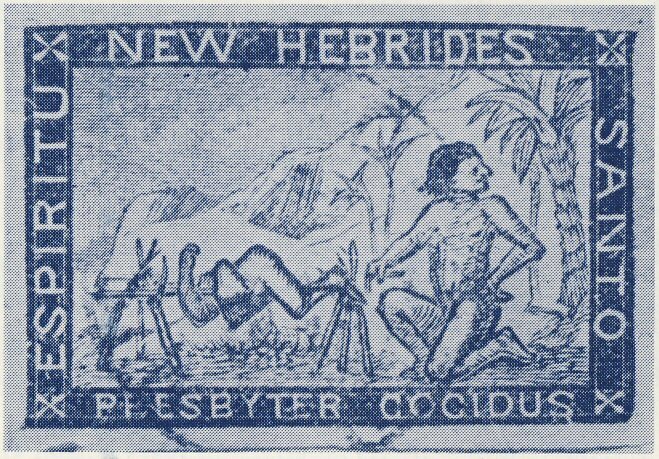 'Presbyter Coccidus', (Roast Missionary), amused some of the colonists greatly, but one, taking my design seriously, suggested at a meeting where the subject of my proposition was being discussed that cannibalism, being a thing of the past, my design be altered to something more in keeping with the progressive state of the flourishing archipelago. G. Collingridge." See original 'Hour Glass' article at left. I blanked the corners so these images cannot be used to produce more fakes! 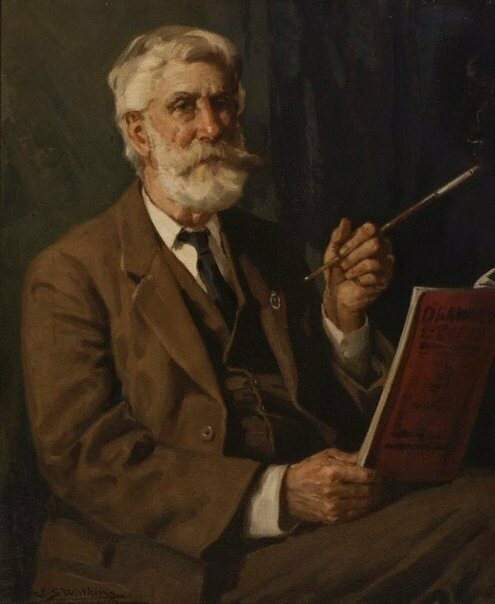 George Alphonse Collingridge de Tourcay (1847 – 1931), Australian writer and illustrator. You can find more information in the Australian Dictionary of Biography He was a reputable woood engraver (xylographist), was a member of the Council of the Royal Geographical Society of New South Wales and left for the Islands on 10 October 1902 on the steamer AUSTRALIEN (Captain H. Verron) to Noumea to find out wether early Spanish navigators in the South Seas first landed at Port Curtis, Queensland or the New Hebrides. AUSTRALIEN was back in Sydney on 20 October 1902 and Mr. George Collingridge was a passenger again. 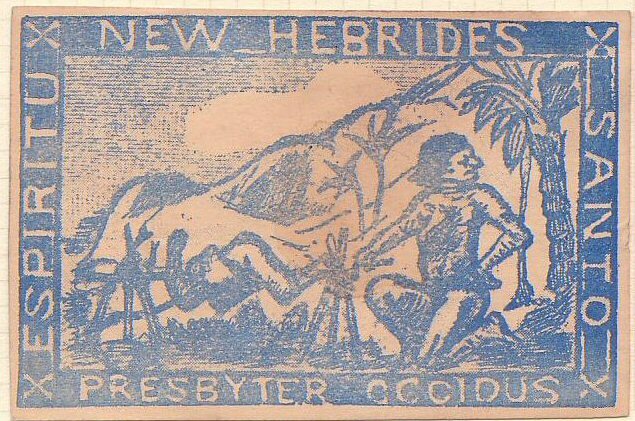 A typical journey from Sydney to Noumea takes about 3½ days so his stay in Noumea was not longer than 3-4 days - no chance to visit the New Hebrides. 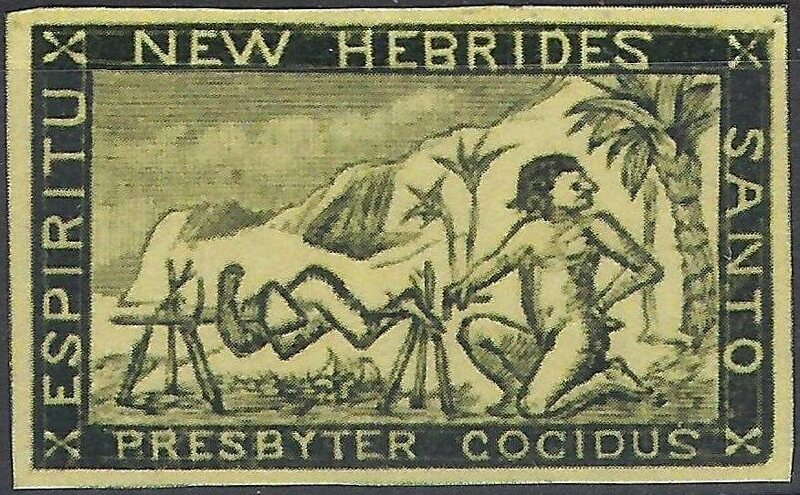 The Roast Missionary cinderellas were made in Noumea. The article says in 1904 "last year". It is possible that Collingridge wrote it in 1903 as he was definitely in Noumea in 1902 and not later. See quotation at left bottom. Image shown in the 1904 "Hour Glass" article by George Collingridge. 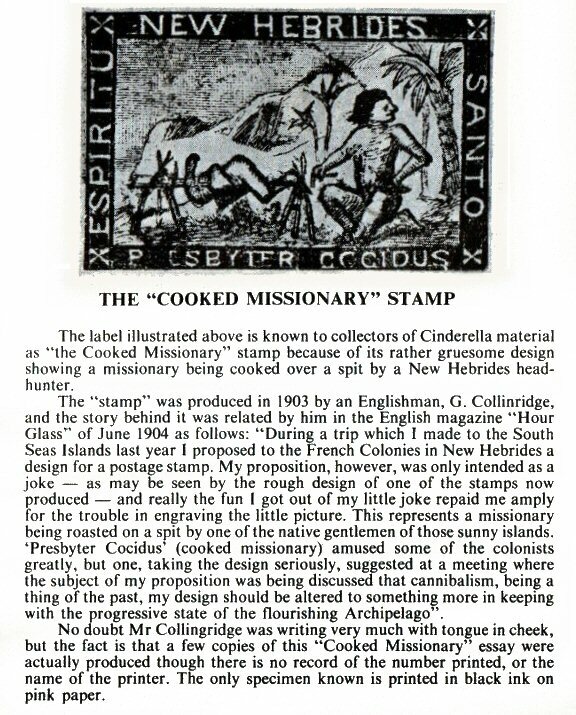 A forgery of the Roast Missionary "stamp" made from the image in "The Hour-Glass". 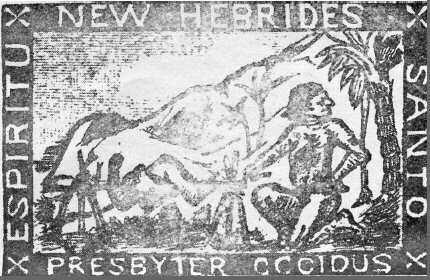 Image shown in the 1967 Hals/Collas New Hebrides book. This is copy #1 at top right on this page. 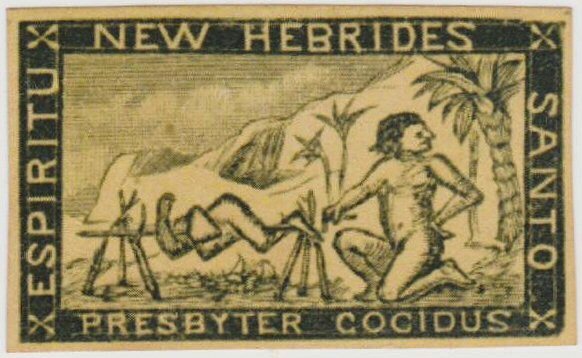 Crude (rubber stamp ?) forgery of the cinderella. Forgery seen on an auction site in 2013. It is a computer printout from an image #2 at top right of this page. 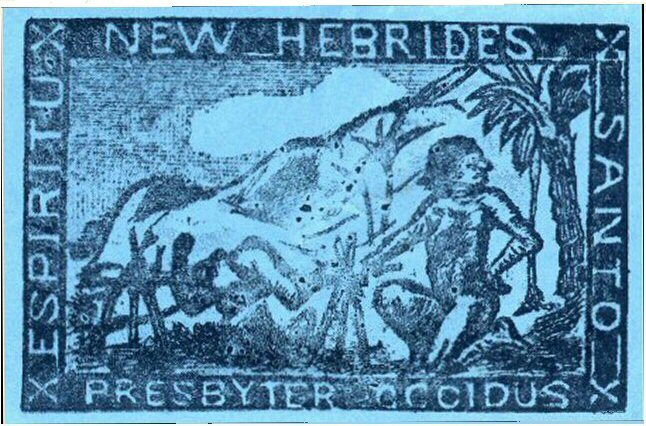 Another forgery made from the Hals/Collas image possibly as at bottom left part of the "Cancel" can be seen. 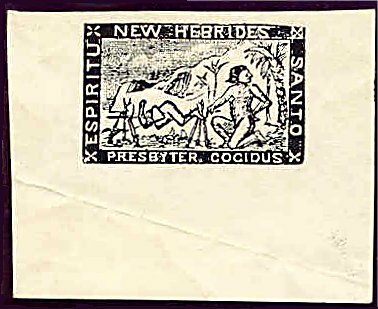 At the moment (November 2013) a seller at Ebay U.S. is selling forgeries of the stamp at top right #2. It is incredible that some people are willing to pay more than $US120 for a forged little piece of paper. The forgery is similar to the one one row higher at left. Offered on Ebay with this wonderful and sharp picture - a forgery of copy #2 at top according to the spot above the dark left mountain. Only a few copies were printed by lithography with black ink on pink paper. This copy here is the ex-Collas copy, also shown in Hals/Collas p.49. According to Collas, one copy is known on cover, and all are said to have been "used". 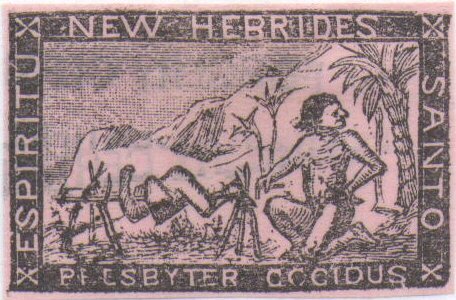 While this item is a fantasy it has a place in the political history of the islands; the eager discussions on a stamp for the group evoked by Mr. Collingridge were a symptom of the desires for stability in the rough frontier, and the settlers seized upon a postal system as a symbol of the stability they desired. A preliminary report published elsewhere upon the accession of this item immediately caused a rash of fakery. People actually bought the illustration, - on slick periodical paper by typography, - in spite of the statement therein that the original was lithographed on pink paper!" 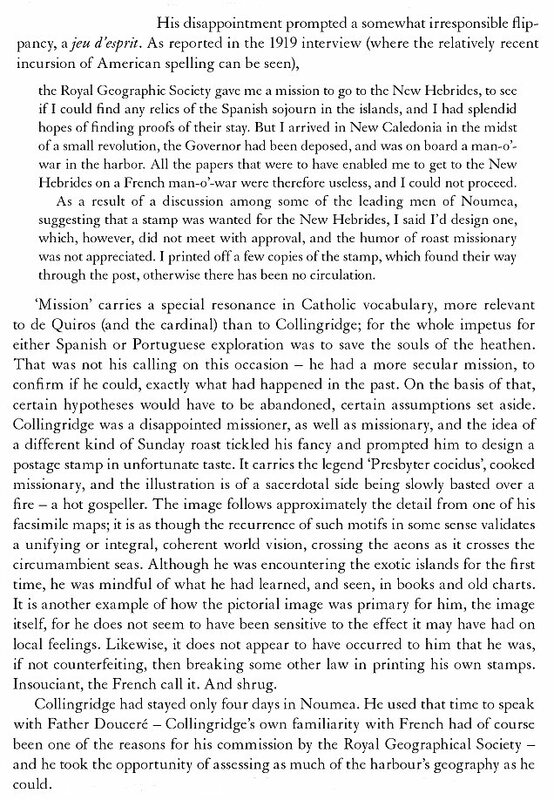 But Hals/Collas were wrong here: the originals were printed by xylography (= woodcut), and not lithography. These clippings from #1, #2 and #3 at top right show the typical individual differences occuring with this method of printing by xylography. You may want to compare this area with the same of your copy.